The main concern of the pharmaceutical packaging market has always been the integrity of the drug, and, in the case of parenteral dosage forms, its sterility. In order to fully meet these requirements, IMA Life has recently mounted on Xtrema LV, In-line Filling & Stoppering machine, the Micro Motion mass flowmeter provided by Emerson Process Management. STERIFILL ampoule filling and sealing machine is a linear filler suitable to process 4, 6 or 8 ampoules at each machine cycle, according to the output required. Aseptic filling is one of the most critical phases of pharmaceutical production processes. In addition to maintain the necessary aseptic conditions, is essential to ensure that the liquid inside the vials is filled with extreme precision and, possibly, in the shortest possible time, so as to guarantee high production speeds. In order to fully meet these requirements, IMA Life has recently mounted on Xtrema LV,In-line Filling & Stoppering machine, the Micro Motion mass flowmeter provided by Emerson Process Management. How many times have we entered in a drugstore and, prescription in hand, we bought bottles of ready-to-use antibiotics? So many times we don’t certainly succeed to remind, because when we do something that seems obvious, we don’t pay attention. Opening a pack of medicines our concern is to heal as quickly as possible, and certainly not the one to see if the product you have purchased meets strict international health regulations or exactly matches the dosage shown on the label. Actually, the calmness by which we, as well as other billion people in the world, we assume drugs is often attributable to Italian technology. When we purchase an OTC (Over The Counter) product at the store, a drug or a cosmetic, we don’t know but, in most cases, we are able to do so thanks to Made in Italy technology. A technology like the one of IMA, colossus by over 850 million euros in revenue, with an export share about 91% and about 4,600 employees, more than 2,300 of whom overseas, scattered in 80 countries, world’s leading producer of automatic machines for the processing and packaging of pharmaceuticals, nutraceuticals, cosmetics, food, tea and coffee. The Group which has its headquarters in Ozzano Emilia, Bologna, has based its philosophy on research and innovation. Basically, its position of leadership is for the most part the result of significant investment in R&D. Every year the Company capitalizes more than 40 million euros in research activities. Always at the forefront in Aseptic Processing & Filling, sector where The Group operates by IMA Life (one of the Pharma Divisions), it is worthy to emphasize that 50 technicians and engineers from this division are dedicated to development and product innovation. Of course, much of the equipment produced in the workshops is supported by a large network of specialized subcontractors, but it must be said that the key technologies, which give to machines that indisputable quid that differentiates from competition, are and will continue to remain an internal corporate prerogative. 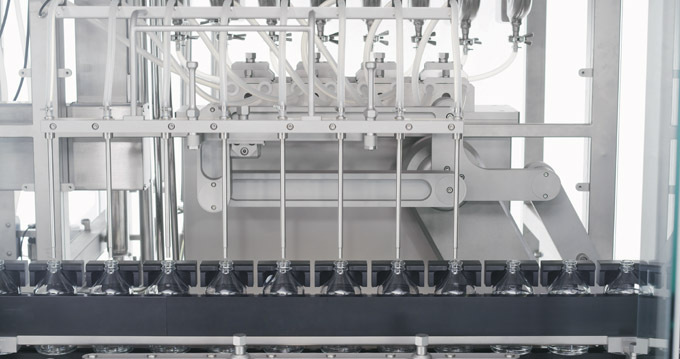 Exactly like the innovative filling system which IMA Life technicians realized for Xtrema LV (Large Volume), an in-line filling & stoppering machine for the dosing of liquids in aseptic environment , with an output up to 140 pcs per minute. The heart of the innovative solution that allowed IMA Life to get astonishing results in terms of filling range, accuracy and repeatability in the dosing of pharmaceutical liquids can be attributed to the Micro Motion mass flowmeter supplied by Emerson Process Management, whose staff has worked with the R&D Department of Company in a development process lasted five years. A standard catalogue product as the Micro Motion flowmeter mass flow rate is the heart of an innovative customized solution applied on the Xtrema LV machine. “Innovation and customization are our main competitive tools, that allow us to deliver special machines”, explains Ivan Ragazzini, IMA Life Responsible for Hardware and Software. “Standard catalogues does not exist within IMA. We generally start from a Customer question, i.e. : How can I get an output up to 600 bottles per minute with high level of accuracy and repeatability? Our success starts from here, from a customized design: each line is different from the other and every time all of us are involved in a challenge, to fulfil at the best any specific requirement”. Therefore, although we speak of the Xtrema LV family, abbreviation that identifies a specific type of machine at the top of the range, let us no choice but to always customize the machine on the basis of Customer’s own needs The machine we are talking about is dedicated to aseptic filling, having tailored features which can be wrapped up as follows: wide filling range, from 50 ml up to 1 liter (Large Volume Parenterals), high accuracy and repeatability, flexibility in batch changes and in CIP SIP operations (Clean in Place, Sterilization in Place). All of this independently of the type of product to be filled in, filing volume requirements, product temperature or density. While counting on check weighing system technology, thus granting a double cross-checking (tare input detection and output gross weight), the machine does not use any conventional pumps, nor time-pressure and not even Peristaltic Pumps, but n. 8 Micro Motion mass flow meters installed upstream the filling nozzles. “One of the reasons that led us to consider the flow mass measure was the result of an ergonomic problem. The use of 1 liter or 500 ml syringes in a linear machine for aseptic environment is not recommended since this would involve the set up of fractionated dosages, with consequent implications in terms of filling accuracy, risks of incorrect filling, etc. Not to mention the cost impacts and the implementation of further procedures to be applied at every batch change. The solution? Rather than equipping each of the eight heads of three dosage syringes from 50-150 ml, 150-400 ml and 400-600 ml – which would lead to a total equipment of 24 devices, the new Xtrema LV employs 8 universal measuring instruments that, whatever the liquid to be filled in the range 50-1.000 ml, do not need to be disassembled neither at the batch change, nor in cleaning and sanitizing phases: we’re talking about Micro Motion mass flow meters supplied by Emerson Process Management”. “By this solution, which is alternative to volumetric or peristaltic pumps, we were able to get a very good accuracy result: 0.5% in 3-Sigma on production batch lasting 8 hours,” says Ragazzini. As an example, assuming you make a batch of 200 doses per minute for an entire work shift, statistical feedback tells us that on nearly 100,000 products, the nonconformity bottles would be around 10 units. This high level of accuracy leads to two advantages. First you have the absolute certainty of the dosage, in other words, of the exact quantity of product filled inside each vial. Ensuring repeatability and accuracy the system provides you with the confidence of having produced the largest number of vials as possible within the tolerance range allowed by the regulations. The fast filling of products in aseptic environment is a very critical operation not only with regards to the accuracy, but also with regards to strict quality parameters that customers require during production. “To get an idea of the quality required, bear in mind that, during filling even a very slight product splash on vial body is a “non conformity”. This is the reason why valve control is not driven by flowmeter directly, but by a logic developed by IMA”. “The motion profiles which drive dispensing valves opening and closing operations have been developed by IMA and are maintained by soft logic PLC”, says Ragazzini. The mass meter system is then used as a pure measuring instrument, whose features in terms of accuracy and frequency allowed the development of specific dosing profiles, able to eliminate the dripping, strokes and, as mentioned above, product splash on vial body. Obviously, all of that at a very high speed”. The Micro Motion mass flow meters are based on a so-called physical principle of Coriolis force (taking its name from the French physicist who studied it extensively in the first half of 1800), which is proportional to the mass of a body in motion in a uniform circular motion. Well, using this principle the Micro Motion mass flow meters allow accurate measurements directly online, that is to say, at the same time as the filling process. In addition to the mass flow rate measurement, the range of Micro Motion tools can also make measurements by volume, density, temperature and concentration, all integrated. Independently from the fluid type to be measured (being a liquid, a gas, sludges, etc. ), the environment and/or the type of process to be checked, Micro Motion meters are the most reliable, flexible and robust solution fit for solving various needs. They can be installed almost anywhere, as they are flange-type devices. Furthermore, as the drift of parameters is absent, once set, the instrument does not require periodic calibration, as it happens, for example, for load cells. As understandable, the possibility to perform measurements directly in line dramatically improves operating times: the mass flow meter allows you to run in a single cycle what before was done in separated phases, thus increasing equipment productivity and availability. In addition to the evident advantages in product, the high mass flow flexibility allowed IMA Life to obtain other benefits, such as for example in cleaning and sanitizing of the circuits. “Ensuring the perfect cleanliness from the product tank to the nozzle, i.e. for all the way the product to be filled passes through, is not a technical matter to be taken for granted,” says Ragazzini. There are international standard procedures on the basis of which it is possible to determine whether washing, prior to sterilization, has been effective. In other words, to verify if the necessary quantity of cleaning solution has reached all internal surfaces to avoid cross-contamination between the batch just ended and the next one. Current practices require the use of Riboflavin (vitamin B2) diluted in water. This substance must be introduced inside the circuit before being submitted to the CIP procedure (Cleaning in place). If there is any residual trace after the washing cycle, the substance acts as a marker indicating whether the washing cycle has been successful or if, on the contrary, the area has not been effectively washed. “Cleaning in place and Sterilization in place validation processes was one of the most critical aspects of the whole project: actually the cross-contamination risk running from a batch to another must be reduced almost to zero”, confirms Ragazzini. “The tests we conducted gave positive results confirming us that the mass flow meter is an excellent solution also from this point of view, thanks to the absence of moving of mechanical parts and stainless steel ducts with very low roughness “. But not only. Further advantages are related to the Micro Motion flow meters’ capability to handle versatile multi variable measures. For example, the detection of the temperature is an essential feature for certifying that inside the circuit, during sterilization, you have actually been achieved and maintained the data set by the Customer in PQ phase. “The same flow mass measurement can be used to measure the amount of detergent used. Temperature, density and/or possible presence of foam in the flow measurement have no influence, the mass flow returns the exact amount of detergent that is passed along the circuit “. We can well understand how the batch change is faster than it typically is. In addition to not having to replace the pumps or any other mechanical parts, washing and sterilization phases are done without dismantling measuring instruments. All of that in accordance with GAMP 4 Guidelines and CFR 21-11 Specifications. The positive experience in the field has led IMA Life management to evaluate further developments linked with mass technology applications on aseptic processing filling machines. “The collaboration with Emerson Process Management has started five years ago, becoming a true partnership. This allowed us to be confident on the technical validity of the solution”. Basically, the Xtrema LV represents the top of IMA Life production range and the acceptance of a technological change like the one introduced in the Micro Motion mass doubtless implies that the customer is able to fully understand the benefits. Nevertheless, as already happened in many other industry sectors, in a few years the measuring technology based on Coriolis effect will provide the perfect base to build machines even in lower range. Proof of this is that time-pressure competition technology, which relates the dosed volume with a variation of pressure over time, though much evolved in recent years does not offer the same guarantees of accuracy of Coriolis Mass. The relationship between the dosed volume, time and pressure keeps it true only in presence of laminar motion: we all know, for example, that nozzles opening and closing cause turbulence. “In addition to being independent from density and temperature, time-pressure technology that characterizes the flow meters Coriolis demonstrates to be unaffected by the kind of fluid motion, whether it’s turbulent or laminar. The measure is in fact related to the effective mass quantities in transit inside the instrument”, confirms finally Ragazzini. The machine has been designed following the criteria typically needed in aseptic environments, such as, reduced dimensions, the geometry facilitating the unidirectional airflow, high ergonomic level, slim design. The very accurate constructive concepts allow the machine to condition ampoules at high speed: up to 400 ampoules/min and the possibility to handle both open and closed ampoules. A combi version is also available to match ampoules and vials filling. The filling of ampoules is carried out by means of volumetric pumps even if the machine can be equipped with other filling systems typical of aseptic operations as Time/Pressure or Peristaltic Pumps. The machine is equipped with brushless motors which make it very flexible and versatile. The machine can be operated from one side only making it suitable for wall installation. The sealing station consists of two stations with different burning temperatures (according to the ampoules glass thickness). The machine is supplied with the gas shut off system in case the flames go out. 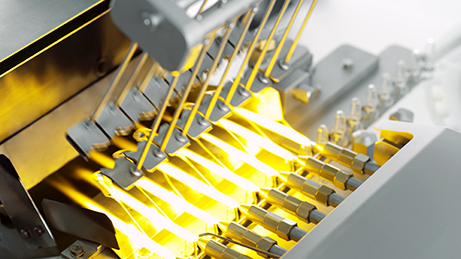 STERIFILL ampoule filling & sealing machine constitutes the core of fully integrated processing lines. 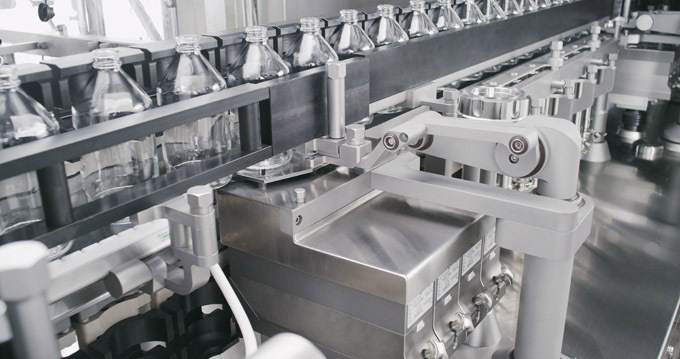 IMA LIFE design and develop complete aseptic processing lines, starting from ampoule washing and de-pyrogenating, through filling & sealing, up to the final labelling and secondary packaging of the product.